Description: Arthur, King of the Britons must find his knights of the round table and go on a quest to find the Holy Grail. Watch the movie and you may yet find out: What is the air-velocity of a laden swallow? This is the only movie I know of that will make it's audience laugh at the very beginning of the movie. The opening shot? No, sooner. The very first frame of the opening credits. This is an absolutely insane movie and it more than succeeds in capturing the spirit of the TV-show. 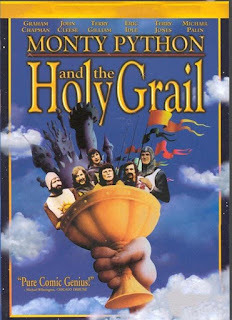 As opposed to the later Python movies, this one is filled with the meta-gags and lack of structure of Monty Pythons Flying Circus. One moment we're visiting a nunnery, the next we're "riding" on a meadow. It has the animations of Terry Gilliams and the slapstick of the rest of the pythons. That said, this movie does not really support several viewings. It is very grounded in the comedy of the 70's and while the movie is consistently funny, some of the deliveries even from the main actors sometimes fall a bit flat and some attempts at establishing a running gag (one meta-gag in particular) don't really work out as just repeating the same thing over and over again doesn't make it funny when it wasn't really all that funny in the first place. However, the little things are almost completely erased by the absolute bonkers script and very funny one-liners. I promise that at the end of the movie you will have new insults to throw at people. Actually, this movie is just very quotable and I guess that's what makes it so endearing, the things that are funny are hilarious. Come for the slapstick, stay for the dialogue.